One of our ‘holy grail’ objectives is to replace the current crazy patchwork quilt of state level laws about concealed carry reciprocity with other states, and create instead an integrated nationwide program whereby a single license from your home state would be recognized throughout the country. Sounds impossible? Sounds impractical? Well, certainly before the renaissance in concealed carry laws over the last two decades, it would have been both (and pointless too!) because few states allowed any type of concealed carry at all. But there has been a steady restoration of concealed carry rights, state by state, and as our earlier article on the steady improvement of state concealed carry laws shows, we have gone from only eight states permitting concealed carry in 1986 to now only one state outright forbidding it in 2011. Sure, there are a few other states that don’t play very fair with their issuing policies, but no-one can deny there’s been a huge change in concealed carry policies. This has revived hopes for a framework whereby one state’s concealed carry permit would automatically be recognized by all other states. At present it is tremendously difficult to know, for sure, which other states your home state permit may entitle you to carry in, and the truth changes fairly regularly as states add or remove other states from the list of states they will accept concealed weapons permits from. Those of us who travel regularly typically end up with two, three, or even more permits in our wallets, and even with all of that, feel somewhat nervous and anxious! There’s a clear analogous example – driving licenses. A car is every bit as lethal a weapon as a pistol, and there are for sure way more auto deaths and injuries each year than there are firearms related deaths or injuries. Different states also have slightly different driving laws (eg turning right on red, speed limits, talking on a cell phone, child car seats, etc) and these variations have not presented any problems in enabling a license issued in one state to be recognized in all other states (and most foreign countries too). 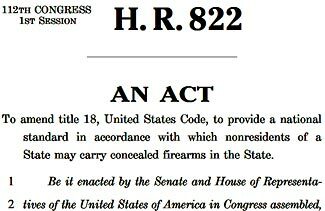 For the last many years, there has been a growing swell of support for a nationwide carry law, and just last week, the House of Representatives passed the ‘National Right-to-Carry Reciprocity Act of 2011’, currently in the form of HR 822 (click the link to see the text of the bill). The bill was passed by a solid majority of 272 to 154 (click the link to see how your congressman voted). A rush of amendments that would have massively watered down the provisions of the bill were all defeated by similar or even greater margins. Anti-gun amendments were most recently proposed by Reps Sheila Jackson Lee (D-Texas), Alcee Hastings (D-Fla), Carolyn McCarthy (D-N.Y.), Hank Johnson (D-Ga), David Cicilline (D-R.I.) and by a Republican too, Rob Woodall (R-Ga). Before it becomes law, two more steps remain. It needs to also be passed by the Senate, and then signed into law by Barry Soetoro Barack Obama. There is of course a Democrat majority in the Senate, unlike in the House, so this makes for a tougher passage. But as the most recent opinion polls show, gun ownership is enjoying the most favorable level of public support in decades, and so at least some Democrat senators may prove sensitive to the winds of public opinion and join the Republicans to pass the measure. Which leaves our President’s approval as the remaining obstacle. For whatever reason, the current President has shied away from overt anti-gun acts, and in total, he has only vetoed two pieces of legislation in his almost three years in office. He has been silent so far on whether he would support the legislation or not, so who knows what would happen at that point. Some normally pro-gun rights groups have spoken out against HR822, claiming that it would create a new federal right to interfere in state level gun rights. These people believe that any time we pass any element of gun related rights and legislation to the federal government, to the Department of Justice and to the BATF, we risk having those rights surreptitiously diminished and taken away. We can certainly understand the cynicism of such people. But if you read the text of the bill that has been referred on to the Senate, there is nothing in it at all to be concerned about. Furthermore, the various amendments that would have indeed added provisions that would be negative or constraining were all soundly defeated. So, if HR822 passes as it presently is written, we would seem to have a great bit of legislation that removes rather than adds gun control restraints on us. And if there are attempts to rewrite HR822, at least at present there is little reason to believe such attempts would be successful. Although we are enthusiastically supporting HR822, we have to observe that it is not without its problems. We can understand the reasons some states require its citizens to pass a formal education course, and in a few cases, even to pass a range test too, before allowing its citizens the right to carry a concealed firearm. It could be said this is similar to the process of getting a driver’s license – every state requires its residents to pass both a theory and practical exam before giving them a driving license. At present, many of the states that require a format course of study prior to granting a concealed weapons permit have chosen to only recognize permits issued by other states that have similar training requirements, and have refused to recognize permits from states that issue permits without requiring any training at all. HR822 would now obligate states with more restrictive training requirements to accept permits from out-of-state citizens who were granted permits on a more liberal basis. And so you might have two people walking down the street, both with a concealed weapon, one a resident of the state who had to attend an eight hour class and then pass a range test for safety and accuracy in shooting, and who has to renew his license every five or fewer years, and the other, a visitor from another state who has a seven year permit which he got simply by paying a fee and filling out a form back home. That feels a bit wrong, somehow. At least there are some elements of standardization on driving license testing across the country. But we’d much prefer ‘a bit wrong somehow’ to the situation instead where the out of state visitor can’t carry at all. Furthermore, there is no evidence to suggest that people who have attended mandatory classes are any more (or less) likely to pose a risk to public safety when carrying their weapon than is the case with people who have not attended any mandatory classes. Please phone or email or fax or write to your two Senators, asking them to support HR822, the National Right-to-Carry Reciprocity Act of 2011, and to ensure its speedy passage through the Senate. You can get contact details for your senators here. If you are writing a letter, you could adapt one of these two letters and personalize it a bit before sending it. HR822, the National Right-to-Carry Reciprocity Act of 2011, passed the House last week by a strong majority of 272 to 154, including almost every Republican Congressman. It now needs to be passed in the Senate, too. I know we have to carefully consider the implications of all legislation that may potentially either expand or diminish current gun rights in this country, and I know we must be respectful of state rights. But with now 49 of the 50 states recognizing, in some form or another, the right to carry a concealed firearm, this legislation is not an end-run around the states. It is merely a necessary national codification of the currently very confusing patchwork quilt of state/state reciprocity agreements in terms of which states will accept carry permits from other states. We can do it for driving licenses (and I’m sure I don’t need to quote the appalling levels of deaths and injuries suffered as a result of vehicle accidents, massively in excess of those resulting from firearms). We need to do it for concealed carry licenses too. I’ve been licensed to carry a concealed pistol for many years, and have never created any problems. But as soon as I cross the state line, I either lose that right entirely, or risk ending up in a twilight zone of uncertainty – an uncertainty shared by each other state’s law enforcement agencies, too. Who knows what the most current and correct situation is in each state for each of the other states’ licenses? Probably no-one! This necessary legislation makes it easy, simple and straightforward for everyone. It doesn’t trample over state rights, because out of staters still must follow all the applicable rules of the state they are visiting (the same as with driving). It merely allows a person duly approved and licensed to carry a handgun in one state the certainty of knowing they can safely do so in other states without risking becoming an accidental felon. Please may I ask for your support of this sensible measure and to help its speedy passage through the Senate. HR822, the National Right-to-Carry Reciprocity Act of 2011, passed the House last week by a strong bi-partisan majority of 272 to 154, including 43 of the Democrats. If posessing a gun, is indeed a federal right, why do I need a permission slip from congress? Because there is a difference between possessing a gun and carrying it around in public loaded and hidden somewhere on your body. Your comment is specious, and represents a fall-back desperate position on the part of gun-grabbers. Do you really think that the right given to us by the Second Amendment to keep and bear arms doesn’t also mean that they can be loaded? Do you think the founding fathers wanted to restrict us to only carrying unloaded guns? As for the issue of a gun being concealed/hidden or worn in public, this too is another desperate attempt to confuse things by gun grabbers. In states that allow both open and concealed carry, the gun grabbers try to prevent open carry – most recent example being California, which has now restricted the ability to open carry – a former ability which was close to meaningless anyway because Californians were only allowed to open carry unloaded weapons (how useless is that). It is generally best for all concerned to conceal one’s firearm, but the gun grabbers now try to force us to a less appropriate situation, which they can then attack further. So, while there may be a ‘difference’ between possessing a gun and carrying around in public, loaded, and while there may be a difference between open and concealed carry, the Second Amendment makes no distinction between any of these things. It would seem to apply equally to all situations.